Raised in a military family, Rev. James Joseph Beates earned his theology degree from Gordon-Conwell Theological Seminary. He moved to Michigan from West Falls, New York and lived in Detroit and Garden City. Beates was the first openly gay pastor to serve in the Presbytery of Detroit and was active in Friends Alliance. He died from AIDS-related complications at age 44. Born in Middleville in Barry County, Rexford Palmer moved to Detroit as a young adult to work in retail. 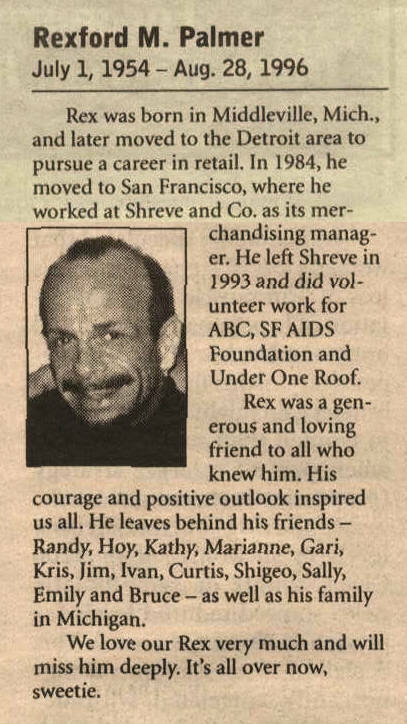 He continued his retail career after relocating in the mid-1980s to San Francisco, where he became active in the San Francisco AIDS Foundation. Rick Rapaport worked as a janitor, gas station attendant, cab driver, waiter, cook, bus driver, and for two years as wrestling coach at the Michigan School for the Blind. After dropping out of the University of Michigan in 1974, he visited 45 states and crossed the U.S. fifteen times, returning to school to finish his B.A. at Michigan State University in 1982 with a degree in journalism. He died of complications from AIDS at age 31. Born in Detroit, Janice Zygmontowicz moved to Mt. Pleasant in the 1970s to attend Central Michigan University, where she earned four varsity letters, and played for the championship field hockey team. She worked as an electrician at CMU and later earned a Master’s degree in counseling and became an outpatient therapist. New Jersey native Susan Green worked as a field organizer for the Michigan Organization for Human Rights from 1983 to 1985 before moving to Madison, Wisconsin. George Fadiga was a tireless activist with the Hope Fund, the Human Rights Campaign Michigan Dinner, the Motor City Business Forum, the Midwest AIDS Prevention Project, and other Detroit area causes. At the time of his sudden death he worked as a sales representative with Crain Communications. Terri Jewell was a noted lesbian feminist poet in Lansing whose work appeared in more than seventy publications.